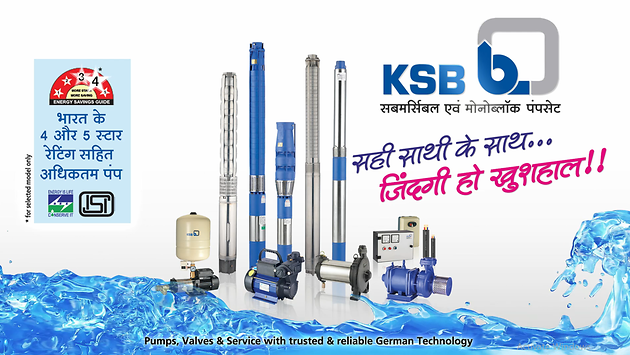 Of the many firsts to the credit of KSB Pumps Limited in India, the first “first” was a submersible pump – a water pump with a submerged motor, to provide millions of liters of water needed for the Green Revolution. Thus KSB introduced a concept unheard of to the Indian customer at that time … that of a submersible electric motor running under water! Today, KSB in India manufactures a wide range of Submersible motor pumps at its own ultramodern manufacturing unit located at Sinnar. Present product range is from 3" (75 mm) up to 14" (350 mm) in size and power ranges from 0.5 hp to 150 hp. To take care of variety of applications and site conditions like water handling applications in agriculture, domestic use, irrigation etc. hydraulic components are manufactured using high grade quality material like NORYL (engineered plastic), Cast Iron, Bronze and even Stainless Steel. In motor, Stator windings are made with virgin Copper ensuring minimal power loss. Robust design of thrust bearings handles all types of thrust load. Shafts made of high grade Stainless Steel ensures smooth running of the pumpset. Motors are protected from water using Stainless Steel jackets. Each pump and motors is manufactured with state of the art manufacturing processes and a stringent quality test standards ensures a reliable end product. These pumpsets are available in India through our dealer network of over 800 dealers spread across India and served round the clock by our well trained over 200 authorized service centers. You can download few brochures for water. Please visit the download section for all products brochures.